The Queensland Unclaimed Letters database provides an index to all 202,473 names in the monthly lists of Unclaimed Letters published in the Queensland Government Gazette, between 1860 and 1874. It's a valuable aid for locating early colonists in Queensland. Knowing where our ancestors were is often not easy to determine, particularly if no significant event occurred which left a paper trail. Many of them moved frequently, either seeking employment or chasing gold. As a result, letters were often not able to be delivered, as the last address was no longer applicable. The addresses given in this index will assist tracing where that ancestor was living, even if he or she was no longer there by the time these letters were due for delivery! 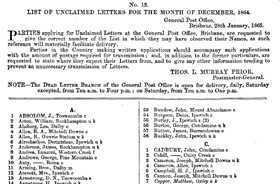 The lists of unclaimed letters were published monthly in the Queensland Government Gazette, usually in the following month (for example, the December 1872 list was published in January 1873) though occasionally at the end of the month. It is no longer possible to claim the letters mentioned in this index. At the time the lists were originally published in the gazette, those wishing to claim their letters could do so by following the procedure below. "Persons applying for Unclaimed Letters at the General Post Office, are requested to give the correct number of the page on which they may have observed their names, as such reference will materially facilitate delivery." ... "Persons in the country making written application should accompany such written applications with the amount of postage required for transmission; and, in addition to the former particulars, are requested to state where they expect their letters from, and to give any other information tending to prevent an unnecessary transmission of letters." Most letters in the lists from mid-1862 have a code for the origin or type of letter, and these are included in the index. Only a few of the codes (see below) are described in the Gazette. Many appear to be compounds of those listed (for example, "c f" can probably be interpreted as "c" and "f"), for others it is possible to make an educated guess (for example, "u s a"), yet others remain a mystery. Letter codes include: a = South Australia, c = Colonial, f = Foreign, m = Victoria, nz = New Zealand, oc = Official Colonial, o = Dead letter, s = New South Wales, t = Tasmania, u k = United Kingdom, wa = Western Australia. If you're looking for ancestry in the Queensland region, this is a great genealogy tool for anyone exploring their family history or building their family tree.